The FIA released several more details concerning the crash which injured Formula One driver Jules Bianchi today during a press conference for the Russian Grand Prix. FIA president Jean Todt was joined by medical rescue coordinator Ian Roberts, race director Charlie Whiting and chief medical officer Jean-Charles Piette at the press conference, where they gave a step-by-step explanation of the video of the incident at Suzuka. "There is a dryish line [in Turn 7], but as the rain is intensifying a little bit of water crept on to the drier line. As cars go a little bit wide there, you see Adrian got onto that and lost control. 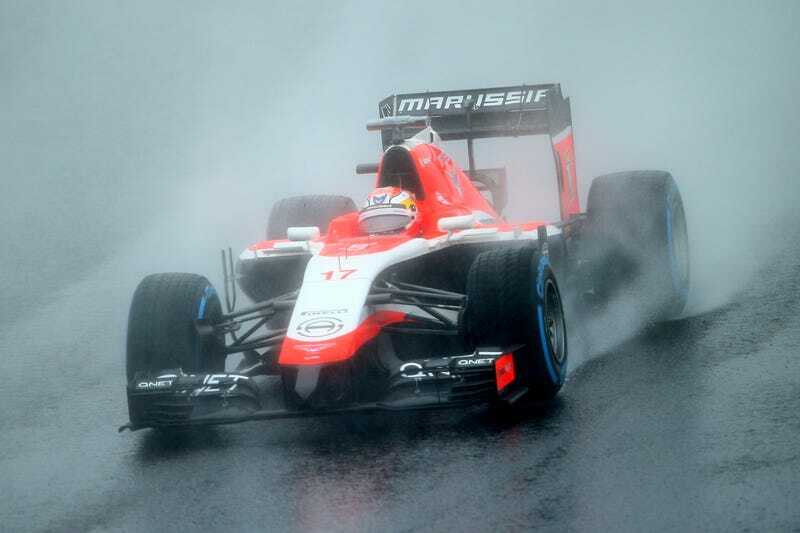 He just touches that slightly wetter part of track, and he is behind Jules at this point. At that point he hits that slightly wetter bit of track and loses control and spins." "You can see Jules doing something similar [to Sutil]. He hits the same bit of water, but he doesn't spin like Adrian did. He over corrects and goes off at a slightly different trajectory." Some cars had slowed down more than others as well for the yellow. The FIA is considering defining exactly how much slower racers should be traveling under yellow flags in Formula One. Currently, Charlie Whiting is working with the teams to ensure that any additional rules put in place after this accident make sense. The idea is to take the decision on how much a driver needs to slow down for a yellow flag away from the driver themselves to ensure that yellow flags will be navigated more safely in the future. An accident on the track is well covered, of course. I think the way in which the marshals reacted, the safety car and the medical car got there in very quick time, the extracation vehicle was dispatched correctly, the ambulance came; nothing could have been done better at the circuit. It's a procedure that we have in place and we know exactly what to do under those circumstances. Jules Bianchi remains in serious but stable condition under the care of doctors at the Mie General Medical Center in Japan.